Buddhist temples in Thailand are unlike any other in the world. They are intricate, colorful and laden with gold. Mark Fischer took this amazing shot of Wat Pho in Bangkok, putting the golden chedi spires in stark contrast with the night sky. There are dozens of major temples throughout Bangkok, not to mention the spectacular temples throughout the rest of Thailand, such as the amazingly pure white Wat Rong Khun. If you have taken a great travel photo, submit it to us and it could be featured as our Photo of the Day. There are two ways to do so, either by submitting it to our Gadling Flickr Pool, like Mark did; or via Instagram, by mentioning @GadlingTravel and tagging your photo with #Gadling. Chinese officials have announced a controversial plan to demolish a number of buildings at an ancient Buddhist temple located in the city of Xi’an in the province of Shaanxi. This drastic move is intended to improve the site’s possibilities for being designated a World Heritage Site, even as the inhabitants of the temple express their displeasure over the idea. 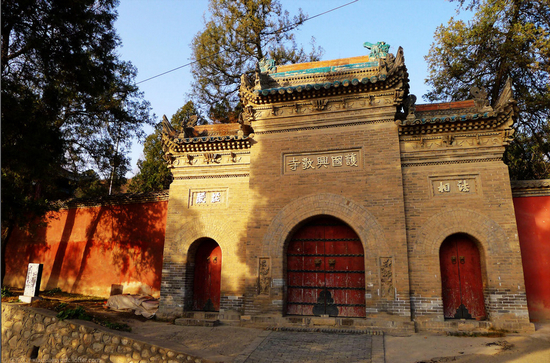 The 1300-year-old Xingjiao Temple is well known for housing the remains of a monk by the name of Xuanzang. He is credited with bringing the earliest Buddhist texts from India to China and introducing the Buddhist philosophy there. Xuanzang and his friend the Monkey King are also the main characters in the classic Chinese fable “Journey to the West,” which is one of the best know stories in all of Asian culture. Because of his role in that tale, and in helping to bring Buddhism to China, local officials are hoping to get the temple named to the World Heritage list – a designation that generally translates to more money in the local economy. In an effort to improve their chances of earning that distinction provincial authorities have made the decision to dismantle roughly two-thirds of the buildings on the temple grounds. Most of those buildings are newer than the main compound and the feeling is that their removal will open the space to make it appear like a more natural setting.When it was first announced that the site would be nominated for World Heritage status, the monks that live in the temple were supportive of the idea. But when they were told about the demolition of the buildings, which include a dining hall and several dormitories, they withdrew their support and filed a protest. Their feeling is that the destruction of the buildings would disrupt their daily lives and diminish the temple as a whole. They also note that even with the removal of those buildings, the site may still not be accepted into the World Heritage program, which means they structures would have been eliminated for nothing. Officials from Shaanxi have ignored those protests, however, and are preparing to move ahead as planned. They want to relocate the monks to another site and begin the demolition of the buildings by June 30 so they can proceed with the World Heritage application process. While it isn’t exactly a new thing to exploit ancient sites for economic gain, it is sad when those sites are altered dramatically in this way. If the plan moves ahead, and the buildings are destroyed, I certainly hope that the site at least gets added to the World Heritage list. If not, this story will be even more tragic than it already is.